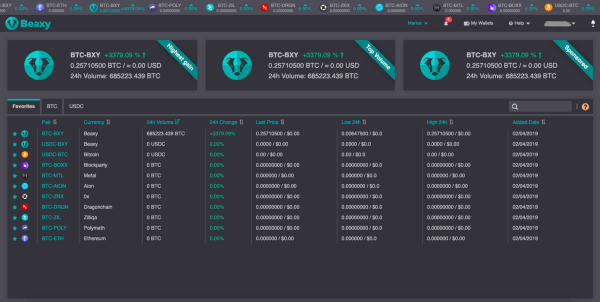 As some of you may be aware I have been involved in the Beaxy beta testing over the last couple of months and orginially released an article called A first look at the Beaxy Exchange. The beta testing is essentially a group of users trying to break a system and look for bugs before the exchange goes live. 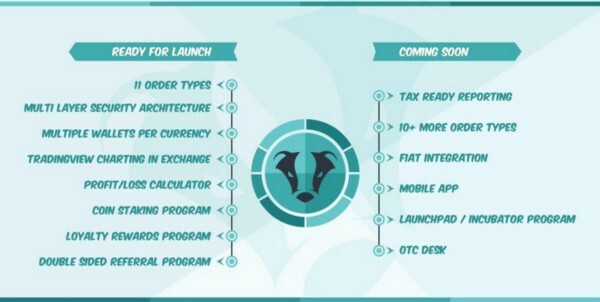 It also gives us a preview to what we can expect from the Beaxy exchange as we see the functionality and the interface first hand before launch. I wrote the previous article after round one of the beta testing and we are currently testing in the third and final round. Due to other commitments I didn’t participate in round 2 so there was even more noticable differences for me to pick up on and talk about. But first, what is Beaxy? One of the first things I noticed when I checked out the interface for the first time during this round was that the above the fold design was still very much in place. Although it doesn’t seem a significant point to make nor a noticeable change made to the user interface (UI), it shows that the team have stayed true to the users and listened to what they like about the interface. With so many changes and additions being suggested, it would of been easy for the team to implement these features and extensions resulting in the above the fold design being lost. The reason this is so important in my opinion is because it makes it very difficult to get lost as there are no over-extended or overwhelming pages for a new user with little experience to interact with. You cannot scroll down on any page including this markets page. A really smart and unique implication is the calculator. I feel this feature will be extremely valuable for traders of all levels of experience. 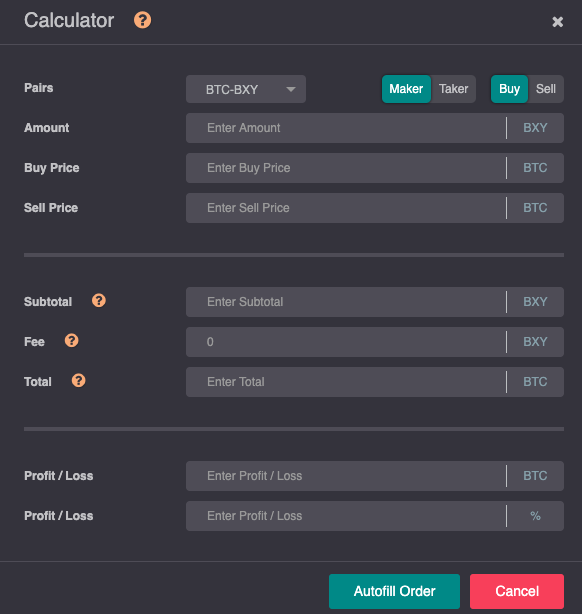 The calculator basically allows you to input trading data to see how your trade will play out in certain scenario’s. A great way to view your potential profits and losses and therefore plan your trade meaning you can be certain of your risk:reward ratio. I like how the user can also execute the trade from the calculator itself. This results in a much smoother user experience as it is not necessary to remember any figures to then input again into the standard order submission box. The only potential improvement I can see on this feature is to give more clarity around the maker and taker fees next to the toggle at the top. Although it may be obvious to you or me, people who are new to trading are not always going to know what these fee’s are or what they mean. If there was an icon button, some hover text or a link to give quick access of an explanation then I think this could potentially solve the problem. Although it is not directly linked to the user interface, there are a number of factors behind the scenes that may impact the users experience. Customer support is a prime example of this but one that I want to mention with Beaxy is the tokens that will be listed on the exchange. I mention this because when I was looking through some of the different tokens that are listed on the beta exchange, it made me realise that it is such an important factor. As a trader, I want to be able to trade the majority of alt coins on a single exchange to make it more convenient for myself. If Beaxy have the majority of these tokens listed, then it automatically improves the use experience in my opinion. You can find a list of all the tokens that will be listed on the Beaxy Exchange here. Although it doesn’t have every token, it’s a solid start with some big projects listed and I can only imagine that this list will increase in time. A list of tokens that I seen on the Beta platform. During the beta testing we have been encouraged to not just report on any bugs or flaws we have found in the platform, but to also note down any recommendations for the team to take on board. It’s great to know that an exchange is listening to what we, as users have to say and what we want from an exchange. An example from myself during the final round of beta testing was that I personally suggested that we should be able to order and refine our wallets through a variety of ways. Whether this is through A-Z name, BTC value or any other way. I personally felt that this feature would be useful for me when using an exchange. After speaking to the team they recognise this and are considering the feedback that I have provided. Clicking on the green subheadings to order the wallets would be extremely useful. Firstly, I want to say that I think it is really good to see an exchange taking both user testing and user feedback so seriously. Not just a quick round of testing, but thorough testing to ensure that the product is as near to perfect as possible when the launch day comes along. Despite the team having some ambitious and exciting plans in the 2019 roadmap, they aren’t rushing to get a product out there that isn’t going to meet expectations which I can appreciate as a user but also a UX professional. My opinion from the first article hasn’t changed. I am still bullish on Beaxy being a successful exchange in the cryptocurrency space with a driven and passionate team behind the product. I’m looking forward to the launch and using the exchange in the real world and am equally as excited to see further progress later in the year such as fiat integration. If you have any questions for myself or the Beaxy team, drop me a DM on Twitter and I’d be more than happy to help. You can sign up to the Beaxy Exchange here. To stay up to date with all Beaxy related news you can join the Discord here. I have not been paid by the Beaxy team to write this article. This is something I volunteered to do due to my background in UX. All opinions and views within this article are my own. The link above to sign up is a referral link. I have been given private beta access for testing purposes only as a Beaxy ambassador. All amounts on the screenshots are for paper trading. They are not real amounts of BTC/BXY. Find out more about Malone at Cryptmalone.com or on Twitter. Next Plinko’s Picks – DAPS: Cult. Classic?